What exactly are liquidity spreads and liquidity spread risk? And how can banks incorporate liquidity spread risk into their risk management framework? Typical retail banks often use short-term funding such as customer deposits to fund long-term loans. The profitability of this business activity is highly dependent on the pricing of the deposits and loans. External client rates can be split up in an interest-rate component, a liquidity spread and a margin covering, for example, operational and credit risk. To limit the risk of a decline in profitability, banks often hedge the interest-rate risk as part of their risk management framework. Since the global financial crisis of 2007-2008, it has become clearer that the liquidity spread also has a significant impact on profitability. However, the measurement and hedging of liquidity spread risk is still at an early stage in the banking sector. In this article we use a stylized example to illustrate the impact of liquidity spread risk on banks’ earnings. Furthermore, we discuss which challenges banks face regarding the management of liquidity spread risk. The global financial crisis of 2007-2008 was a major turning point in terms of liquidity in the financial system. In preceding years, funding was available on a large scale and at low rates, especially for creditworthy and large banks. These banks often only paid a small spread above the swap rates for attracting funding. This enabled banks to earn significant profits. Meanwhile, there was a wide belief in the sustainability of the attractive funding conditions. During the global financial crisis, liquidity declined as banks were less willing to lend to each other because of their uncertainty about the exposure on structured products. To account for declined liquidity, banks charged each other a higher spread on top of the swap rates when lending funds. The liquidity spread can therefore be described as the spread banks pay and receive on top of the swap rate to account for liquidity. Liquidity spreads exhibit procyclical behavior as liquidity spreads typically decrease during economic expansion when there is plenty of liquidity, while liquidity spreads increase during economic contraction when liquidity is declining or limited. This procyclical behavior also has an impact on the pricing of short-term deposits and long-term loans. As a result, the profitability of a bank is affected by changes in liquidity spreads. The embedded risk of the procyclical behavior of liquidity spreads in banks’ profitability is called liquidity spread risk. Consider a bank that uses retail customer deposits (on-demand savings) to fund retail mortgages, with a balance sheet as shown on the left in Figure 1. For the analysis in this article, a static balance sheet is assumed. The retail mortgages all have a contractual maturity of 20 years, with a fixed liquidity spread and coupon until maturity. The retail on-demand savings do not have a contractual maturity. The client rates the bank receives on the mortgages and pays on the on-demand savings are shown on the right in Figure 1. The figure shows the contribution of the interest rate component, a liquidity spread and a margin, to the client rates. Cash and cash equivalents are assumed to be non-interest bearing. Figure 1 Balance sheet composition (left) and client rates (right) for the bank. The earnings for the bank are equal to the difference between the client rates it receives on the mortgages and pays on the on-demand savings. 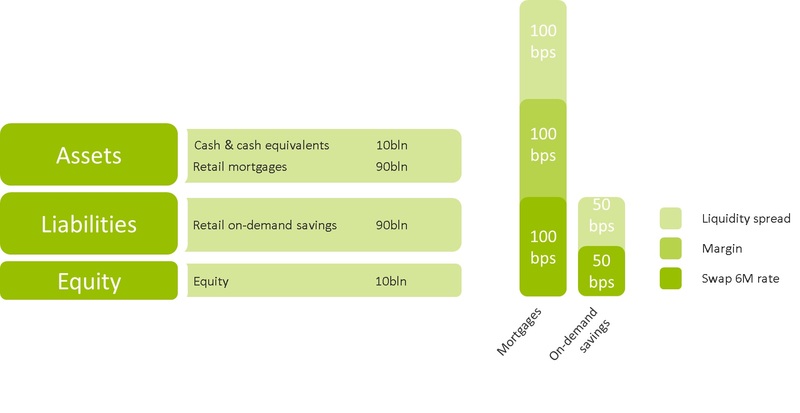 With client rates as shown in Figure 1 the bank’s earnings equal 200 basis points, calculated by subtracting the on-demand savings client rate (100 bps) from the mortgages client rate (300 bps). Half of earnings, 100 basis points, comes from the margin on the mortgage. The other half comes from the mismatch in maturity between the mortgages (longer maturity) and savings (shorter maturity). From Figure 1 it is clear that future movements in each of the components of the client rate have an impact on the bank’s earnings. The impact of these movements depends on the degree of sensitivity of the client rates on mortgages and on-demand savings towards its components. The degree of sensitivity can be measured by the pass-through rate of each of the components. The pass-through rate measures what percentage of a certain change in the market interest rate or liquidity spread is reflected in the client rates on mortgages and on-demand savings. The pass-through rate for fixed-rate contracts is purely driven by the repricing date of the contract, because a contract generally fully reprices at repricing date for both interest rates and liquidity spreads. For savings, this is more difficult as there is no clear repricing date. First, changes in market rate and liquidity spreads are gradually passed through in the client rate over time. Second, when banks would choose to not pass through these changes in the client rate, clients would switch to competing banks that would increase their client rates. The next section shows the impact on earnings for a number of scenarios for the market interest rate and liquidity spread. To show the impact on earnings for the first year, we consider three market scenarios. Next to the base scenario with no changes in the interest rate and liquidity spread, instantaneous parallel 100 bps increases in the market interest rate and liquidity spread are considered. It is assumed that the pass-through rate for the interest rate and liquidity spread for savings equals 50% in the first year (see Figure 2). This means that 50% of the changes in market interest rate and liquidity spread are passed through to the client rates in the first year. For mortgages, the pass-through rate is set at 0% in the first year as these fully reprice after 20 years and no repricing takes place in the first year1. Figure 2 Pass-through rates for the interest rate and liquidity spread for the first year. Figure 3 shows earnings for the three scenarios. In the scenario with an upward shock of 100 bps to the interest rate, the on-demand savings client rate increases by 50 bps. Given that the mortgage client rate remains the same, earnings drop from 200 bps to 150 bps. For liquidity spreads the impact of an upward shock of 100 bps to the liquidity spread on earnings is identical. Earnings drop from 200 bps to 150 bps because the on-demand savings client rate increases by 50 bps and the mortgage client rate remains the same. This example shows that both market interest rate and liquidity spread movements have impact on the banks’ earnings. Under normal market conditions, the interest-rate risk on earnings can be hedged using interest-rate swaps. This is illustrated in Figure 4 for the hypothetical bank in our example. The bank buys a (for example) 10-year interest-rate swap with notional equal to half of the total savings volume. If the market interest rate increases by 100 bps, the client rate increases by 50 bps. However, this increase is offset by the interest-rate swap payoff, which also equals 50 bps. As a result, earnings remain stable on 200 bps. Figure 4 The interest-rate risk for earnings is hedged by an interest-rate swap. However, for liquidity spread risk, such hedging instruments are not easily available (see the text box for more on hedging liquidity spread risk). Therefore, liquidity spread risk can only be managed at the origination of the retail products. Furthermore, without a liquidity spread risk measurement and management system, banks unknowingly run earnings risk. Liquidity spreads have an impact on banks’ earnings. The degree of impact depends on the sensitivity of the client rates on deposits and loans towards the liquidity spread movements. For a typical retail bank using short-term funding for long-term loans, earnings can drop when liquidity spreads increase. Banks can improve their risk measurement and management systems by incorporating liquidity spread risk. A first step might be Earnings-at-Risk scenarios for liquidity spread risk, independent of scenarios for interest rates. This enables banks to gain insight into the impact that liquidity spreads have on a bank’s earnings, and to set up relevant liquidity spread risk management systems. Doing so is non-trivial as banks face several additional challenges compared to interest rate risk management. The main challenges are the measurement of the sensitivity of non-maturing product client rates towards liquidity spreads, liquidity spread risk measurement for business lines in an FTP context, and the hedging of liquidity spread risk. 1 Note that for this example prepayments are ignored for simplification purposes. Banks face a number of challenges in the measurement and management of liquidity spread risk. The first one is the non-trivial estimation of the liquidity spread repricing speed for variable rate products like on-demand savings. The second one is the measurement of liquidity spread risk in a Funds Transfer Pricing (FTP) context. The final challenge is the hedging of liquidity spread risk. As shown in the stylized example in this article, measurement of the liquidity spread pass through rate is crucial for determining the impact of liquidity spread risk on earnings. Measuring the liquidity spread pass through rate is quite straightforward for maturing products like mortgages and other loans, as the liquidity spread is often fixed until a pre-specified horizon. For non-maturing products like on-demand savings this estimation is often harder to make. Analysis on the historical relationship between liquidity spreads and external client rates is a possible approach. The hypothetical bank taken as a starting point in this article is a stylized example, where short-term customer deposits are directly used to fund long-term mortgages. In practice, many banks have a Funds Transfer Pricing (FTP) framework in place which attributes liquidity costs and benefits to each line of business activity. Interest rate risk and liquidity risk is managed by the central treasury department of the bank. Such a framework is also in line with Internal Liquidity Assessment Adequacy Process regulations from for example the Dutch National Bank (DNB). An FTP framework also serves as a monitoring and management tool for the bank as certain products might be priced more or less attractive, thereby impacting the balance sheet structure. This makes it hard to measure, or even identify, liquidity spread risk for business lines. Often liquidity spreads are not externally set, but the bank management can adjust the externally observed liquidity spreads to steer the balance sheet. In this way bank management can influence the liquidity spreads (FTP) business lines will pay/receive on their products. For more information on the possibilities and limitations of FTP, see our earlier publication on FTP. 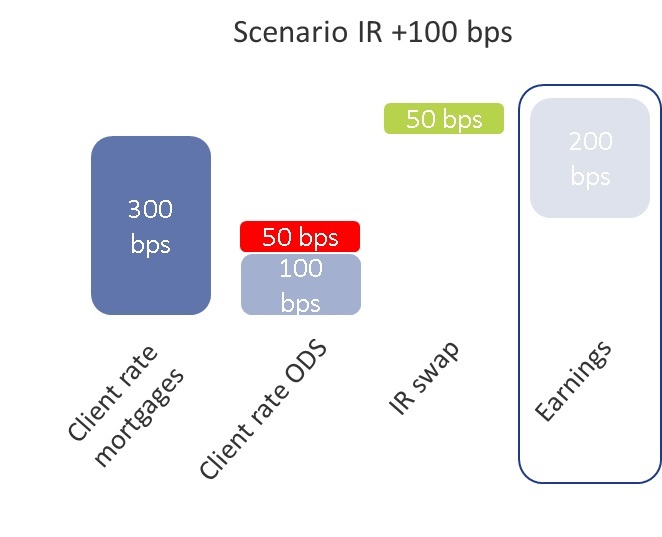 Banks typically use swaps to hedge interest rate risk, aiming to steer towards a target duration of equity as set in the Risk Appetite Statement. Without the use of interest rate swaps, banks bear interest rate risk as shocks in the interest rate will affect the bank’s value or earnings. From a liquidity spread risk perspective, the situation is identical as shocks in the liquidity spread will also affect the bank’s value or earnings. In practice it is, in contrary to interest rate risk where there are plenty of derivatives available to use for hedging purposes, quite a challenge to find suitable derivative contracts. The hedging of liquidity spread risk will be the topic of a follow-up article. Based on our long-standing experience in ALM modelling, we have developed a workshop for Non Maturing Product (NMP) modelling, which includes modelling of on-demand savings and current accounts. The modelling of liquidity spread risk is addressed in this workshop. Furthermore, benchmark results based on a panel consisting of more than 10 banks are included in the workshop; this enables clients to get a clear insight on current modelling performance compared to peers. In case your bank is interested in the NMP workshop, please contact Erik Vijlbrief or Pieter de Boer. Interested in liquidity spread risk? Get in touch with Pieter de Boer or Geert Jan den Hertog for more information about liquidity spread risk. Yes, I would like to get in touch for more information about liquidity spread risk.